Belgium set 30 June 1960 as the date of independence for its colony Congo, and national elections for May 1960. Patrice Lumumba's party won the election and formed the new government with Lumumba as the Congo’s first prime minister, and Joseph Kasavubu as the first president. Yet, dark schemes were afoot in Brussels to deprive the new African state from its independence, its wealth, and its very survival. The CIA arranged for a coup against Lumumba by Congo's Army Chief of Staff, Colonel Mobutu in September 1960. On 17 January 1960, Lumumba was assuredby two Congolese leaders he trusted that he could return safely to his position as prime minister in Leopoldville. But it was a trick, and he and two other officers were tortured on a five-hour flight to Katanga Province where they were brutalized more and then executed. On 13 February 1961, U.S. 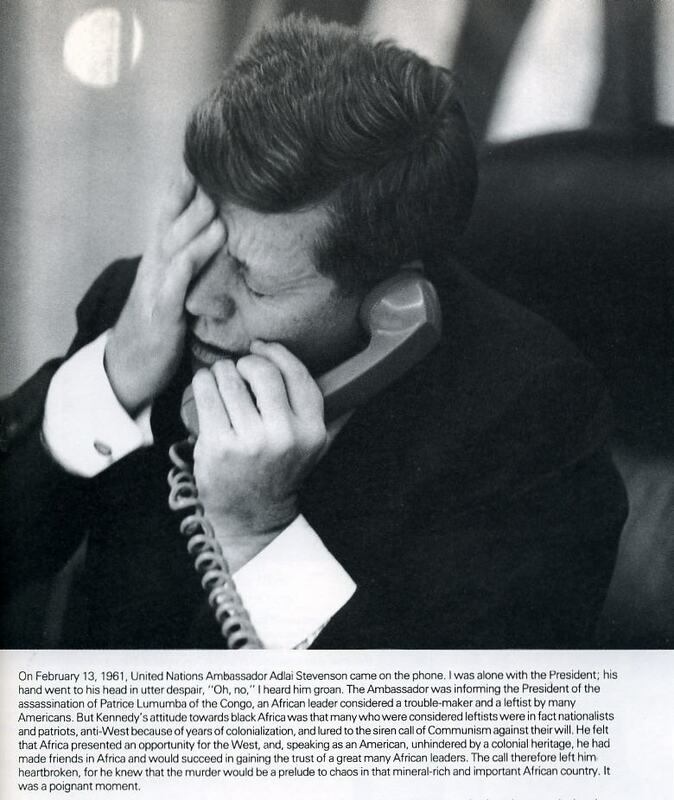 Ambassador to the UN Adlai Stevenson called president Kennedy to report Lumumba's assassination. The above photo was taken at the moment JFK received the news.